Bonsly's official artwork from Pokémon Diamond and Pearl. Bonsly (ウソハチ, Usohachi) is a fictional creature in the Pokémon media franchise. Bonsly is a Rock-type Pokémon formally part of Generation IV, but actually making its debut, even being playable in a limited capacity, in the Generation III game Pokémon XD: Gale of Darkness. 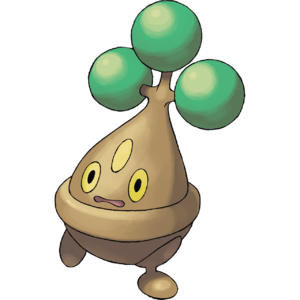 Bonsly is categorized within the Pokédex at #438 as the "Bonsai Pokémon".It evolves into Sudowoodo when it levels up while knowing Mimic. Tackle is a Normal-type move with 50 base power and 100% accuracy (35 and 95% before Generation V) and no added effects. It is a very basic move which consist in a simple charge against a single opponent, and it is part of the starting moveset of many Pokémon. However, Bonsly is unable to learn it by any means. Bonsly is one of the Pokémon that appears out of a Poké Ball. If it is not picked up, it will walk back and forth along the ground, similar to a Bob-omb, and can also fall off cliffs. It can be picked up, and despite its small size its heavy weight makes it behave like a Crate instead of a common item. It can then be thrown at enemies, and while it doesn't fly very far it inflicts 30% damage with heavy knockback, not depending on how it is thrown. After being thrown it also bounces along the ground for a while, retaining its hitboxes. Like any thrown item, Bonsly can be reflected. It can usually only be thrown 3 times before disappearing, but will still disappear on its own after a while. A Bonsai Pokémon. It looks like a plant, but its history reveals it is actually a Rock-type. Its best move among all its speciality moves is Fake Tears. As it grows, it will become skilled at using Mimic, which allows it to copy an opponent's previous move. If it levels up under certain conditions, it evolves into Sudowoodo. This page was last edited on April 5, 2019, at 23:46.